Flying Heritage Museum Photo: John M Dibbs/The Plane Picture Co. In the birthplace of Boeing, it’s natural that aviation attractions abound. Take a trip around the Seattle area to see what all the buzz is about. At the Museum of Flight (*9404 E Marginal Way S; museumofflight.org), kids can marvel at flying machines like the Boeing 787 Dreamliner, NASA’s space shuttle trainer, and even a retired Air Force One. Rack up frequent flyer miles on the flight simulators, or take flight in the cockpit of a Blackbird spy plane. The museum also offers runway tours of Boeing Field so those 8 and older can enjoy an up-close look at a working airport. Floatplanes are another quintessential aerial draw in Seattle, and a flight tour with Kenmore Air (*950 Westlake Ave N; kenmoreair.com) is an experience to remember. Little aviators get a kick out of taking off and landing on Lake Union, viewing Seattle’s sport stadiums from the sky, and waving at people on the Space Needle. For more about aeronautics, propel yourself to the Future of Flight Aviation Center & Boeing Tour (*8415 Paine Field Blvd, Mukilteo; futureofflight.org), located 25 miles north of Seattle. It’s the only public tour of a commercial jet assembly plant in North America. (Children must be at least 4 feet tall to participate in the tour for safety reasons.) Watch Boeing 747s, 777s, and 787s being constructed on the factory floor, and learn facts about the aviation company and its 100-year history in the Pacific Northwest. Back at the aviation center, kids can design a jet and learn about innovations in flight. On the flip side, enjoy a blast from the past in the working hangars at Paine Field, where engineers are restoring historic aircraft to flying condition. Flying Heritage Collection (*3407 109th St SW, Everett; flyingheritage.com), established by Microsoft co-founder Paul Allen, features an assortment of formidable combat aircraft and rockets, while the Historic Flight Foundation (*10719 Bernie Webber Dr, Mukilteo; historicflight.org) showcases important aircraft produced between 1927 and 1957. 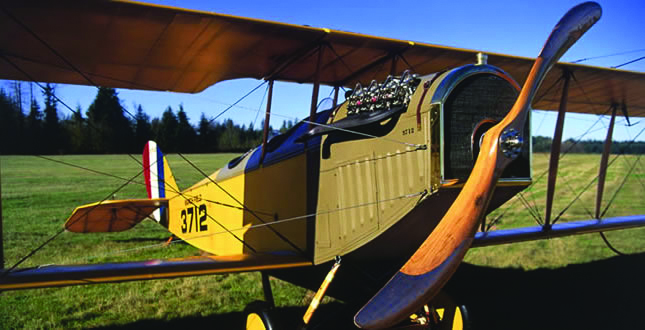 Time your visit with a Fly Day or an air show to see these vintage planes take to the skies.